The Carleton Ravens handed the Concordia Stingers men’s hockey team their first regulation loss of the season with a 6-3 win on Oct. 27 at the Ed Meagher Arena. The first period was a roller coaster of emotions for both teams as Dalen Hedges, the leading scorer on the Ravens, scored on just their first shot of the game one minute into the first period. The Stingers quickly answered less than a minute and a half later as forward Massimo Carozza banged a rebound past Ravens goalie Francois Brassard, for his third goal of the season. After the fast-paced opening three minutes, the Carleton Ravens controlled the majority of the play in the first period. After Stingers goalie Antoine Dagenais gave up the first goal on the first shot he faced, he made three big pad saves during the period, keeping his team in the game. In the first period, both teams got under each other’s skin. A total of six minor penalties were given between the two teams. Stingers forward Francis Brunelle was given a game misconduct with seven minutes left in the period, leaving the Stingers down a man on the bench for the rest of the game. The Concordia Stingers come off the ice at the end of the first period in their Oct. 27 game against the Carleton Ravens. Photo by Kirubel Mehari. Forward Philippe Hudon hit another milestone in his Stingers career in the second period when he scored his first goal as captain of the team, on the penalty kill, early into the period. However, after the goal, the Ravens started what would be an offensive onslaught against the Stingers, firing 22 shots at the Stingers net in the second period. The Ravens scored two unanswered power play goals by first-year player Jared Steege and fourth-year veteran Ryan Van Stralen to give themselves a 3-1 lead midway through the second period. Five minutes into the second period, six-foot-five Stingers forward Justin Doucet and five-foot-nine Ravens forward Dakota Odgers dropped the gloves. Both landed some good punches, but Doucet’s size was too much for Odgers. The Ravens did not take their foot off the gas until a holding penalty by Derek Brown with five minutes left in the second. That finally opened the door for the Stingers to get some offence going. On the power play, forward Anthony Beauregard took control of the puck and fired it towards the net before forward Alexis Pépin tipped it in. Two minutes into the third period, Brett Welychka gave the Ravens a two-goal lead off a shot that beat Dagenais on the glove side. The Ravens did not look back with the lead and added two more goals for the 6-3 win. 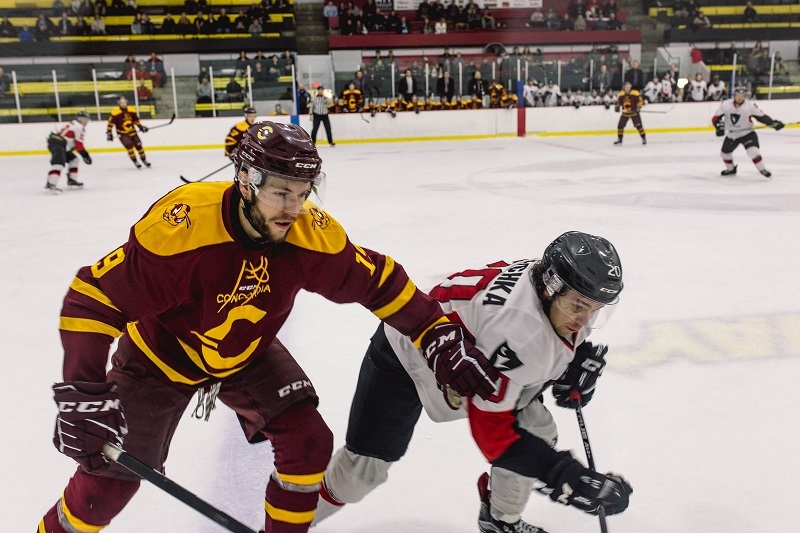 The Concordia Stingers beat the Queen’s Gaels on Oct. 28, 4-3, in overtime. Their next game is at home on Nov. 3 against the University of Ontario Institute of Technology Ridgebacks. Main photo by Kirubel Mehari.